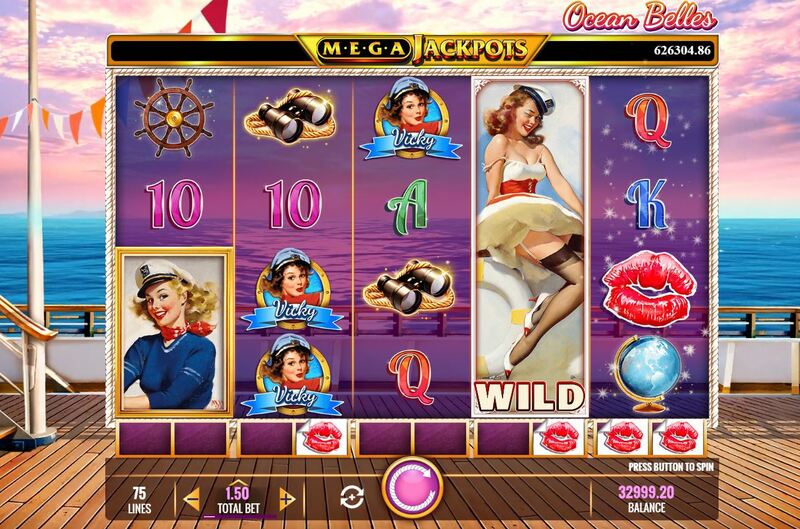 Megajackpots Ocean Belles slot is a revivial of IGT's old land-based casino classic and here it arrives with the Megajackpots progressive added. This also features on several other IGT slots including Isle O'Plenty, Cleopatra, Wheel of Fortune on Air and the Powerbucks version on Hawaiian Getaway. Ocean Belles has the theme of retro 1950's women enjoying luxury yachts with the reels set on the stern as they sail across the sea which moves along with the clouds in the sky. You won't get seasick though as the effect is quite gentle, so will these belles ring for your bankroll? We have 75 lines over a grid of 5 reels of 4 rows each for which we pay 75 coins to spin. As with most recent IGT slots, Ocean Belles Megajackpots has very low line pays although the top symbols appear stacked up to 4 rows high on the reels. The 5-of-a-kind pays for your 75 coins are 300 for the Portrait, the Belles Betty or Vicky 100, Cap or Binoculars 75, Ship's Wheel or Globe 60 with five card values paying 50 coins each for a full line. Bonus scatters appear on all the reels but Wilds have their own special mechanic. Under each reel there are 2 spaces which are filled by red lipstick kisses that randomly overlay the reels. Collect 2 and that reel turns Wild for the next 2 spins. This is a feature you could have seen in Microgaming's Untamed Giant Panda series before, although those games work for 3 spins. If you see golden kisses land they also sit under the reels but disappear when the reel uses its Wild feature. If you can accumulate 5 of these showing at once, one under each reel, then the Megajackpots Progressive is yours! Three scatters will award a choice of free games which scan be retriggered as scatters can land under the Wild reels. You can choose 30 spins with 1 reel Wild, 15 with 2 reels Wild or 5 spins with 3 Wild reels. These amounts are doubled or tripled for 4 or 5 scatters respectively. Despite the low line pays, you can get some reasonable totals here. If you do hit a retrigger, you pick another choice of free spins when the first have expired.